In a matter of weeks, Lara will turn 3. Gulp, how did we get here so fast? Anyway, when we were offered the opportunity to review the latest addition to the Penwizard range of personalised books - Peppa Pig goes to your child's party - I jumped at the opportunity as I thought it would make a perfect birthday present for a Peppa-obsessed little girl. Penwizard personalised books come in a range of different characters and stories such as Fifi, Thomas and Roary but also with different themes such as Knights, Wizards and Fairies. The ordering processes was phenomenally quick (due mainly to the fact that the books don't feature any photos of your child so there is no need to upload images etc.). I specified the book I wanted, whether I wanted a pink or blue cover, Lara's age on her birthday, her name, hair colour, skin colour and a few optional details such as a special message for the first page of the book. Then I gave payment details and voucher details and that was that. Our Peppa Pig personalised book arrived a little under 48 hours after I placed my order. The book is good quality. It reads and looks just like a Peppa Pig book you would buy in a book shop just with that unique quality that one of the characters is styled as your child! The story I chose featured Peppa and all of her friends coming to Lara's 3rd birthday party and I couldn't be happier with the story. At first, it was a little disappointing that the image didn't look more like Lara but then when I thought about it, Peppa Pig is an animation, it would be weird to have a photo of Lara in the book when all the other characters were cartoons. Maybe it would make it that touch more personal if I were able to mention some of Lara's friends or family names in the book too. I think Lara is going to be over the moon with her new book. I am thinking of giving it to her as a gift shortly before her birthday to help her get into the birthday mood - hopefully she won't then expect the real Peppa Pig to turn up to her party! Mind you, Lara isn't stupid and I rather suspect that when she reads the story, she will recognise the episode of Peppa Pig that it refers to and question why Peppa is visiting her own birthday party instead of Zoe Zebras(!) but we shall cross that hurdle when we get to it. The personalised Peppa Pig book from Penwizard costs £14.99 plus postage. You can follow Penwizard on twitter and facebook. Penwizard personalised books are offering Mellow Mummy readers FREE postage and packing if you use the code 150920. Despite having had an achey back since Thursday evening and lots of twinges and cramps there is no further sign of impending labour. I have a busy weekend with two different third birthday parties to take Lara to and a visit from the inlaws. My last day at work was pretty uneventful. It felt good, I'm ready to move on to the next part of my year now - a new beginning. Baby has moved down into a more-or-less engaged position now so movement had become pretty tricky and combined with piles the size of golf balls and a suspected urine infection, I had been bl**dy uncomfortable all week at my desk. At one point there were tears down the phone to the GP begging for a prescription... it worked but its still pretty depressing to be relying on prescriptions even before baby has put in an appearance. So, now I have to play the waiting game. I have an appointment for next Friday for a stretch and sweep but I'm still hopeful it won't get to that point because I am home alone all next week without a car and with only a visit from the burglar alarm engineer to look forward to! I'll keep you all up to date - promise! I will admit that sometimes, as a blogger, I squeal with excitement when I open the post on my return from work and find a well thought-out gift from a brand representative. I love surprises. Mind you, I love surprises from Mr. B more... mainly because they are so rare. Mr. B. is not one for surprise gifts (although he did manage to engineer a very cute cuddly owl from Lara as my mother's day present!). A study by Mr. Kipling during March this year showed that I shouldn't be that surprised at the lack of unexpected treats - women over 55 are much more likely to receive a special treat than people in my age bracket. 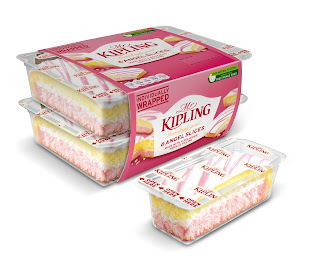 Mr. Kipling sent me my own little treat in the post - a box of goodies which included some of their new Angel Slice and Lemon Slice cakes. Sadly, I can't show you a photo of said cake because it all disappeared in the blink of an eye - this has something to do with a ravenous Lara and the fact that the snap pack cakes come in individual servings so I was able to secrete slices of cake in my work laptop bag for a sneaky afternoon snack. They also sent Lara a surprise - a pack of Mister Maker craft goodies which she ripped open and transformed into THIS - a surprise gift for the baby. How cute is that? surprises all round. Mr. Kipling have been touring the country with a cakemobile which still has a few more stops to make before the 5th of May. Look out for it and you too could be in with a chance of receiving a little surprise. Alternatively, pop over to the facebook page where there are also chances to win a special treat (such as a Merlin annual pass). This is a guest post from my friends at Vertbaudet who, as I found out earlier this year, sell some fab maternity wear. If you are expecting a baby, you might be feeling more and more uncomfortable, especially if you are still wearing your pre-pregnancy clothes. Some pregnancy mums hold off on buying maternity clothes because they do not want to give up looking trendy just to be comfortable. Fortunately, there are plenty of trendy and comfortable maternity dresses for expecting mums. Vertbaudet features an extensive line of fashion-forward maternity wear for women. The type of maternity dress you choose may depend on where you would like to wear your clothes. If you need to find clothing for work, you will probably want to stick with modest dresses that give you plenty of room for when your belly gets larger. A simple v-neck style dress with an empire waist can do a lot to slim your silhouette while still projecting a professional appearance. A black sheath style dress with room for a growing belly might also be a good choice for the office. On the other hand, if you would like to wear your dresses while you are out on the town, you might choose a button-up dress with a dropped waist and short sleeves. You could easily dress the look up by adding boots or strappy sandals and a large bag. Another good choice is a maternity tunic, which you could pair with leggings or jeans for a casual look. A denim coloured maternity tunic dress with a low leather belt is another great option for a night out. Another factor to consider when choosing a comfortable maternity dress is the time of year you will be wearing it. For the summer, a maternity maxi dress may be ideal since it is light and airy, which will help you stay cool in the heat. Maxi dresses are also a great way to streamline your figure, which may make you feel more comfortable with your changing shape. Strappy tunics are also a good choice for warm weather. Simply wear them with shorts and sandals or, if you are brave enough, wear them all by themselves as a dress. If you are expecting during the cooler weather such as late fall or winter, it is fairly simple to adapt your maternity dresses for the weather. If you have a short-sleeved dress, layer it over a turtleneck and add a slouchy hat and a pair of boots. A long-sleeved cardigan over a short-sleeved dress might be enough to keep you warm before the weather turns too frigid. But if you prefer a long-sleeved dress, go with a simple crewneck collar dress with long sleeves. Add a pair of thick tights and a low belt to complete the look. You could also layer the collar with a long, chunky scarf to add a bit of flair and to keep your neck warm. 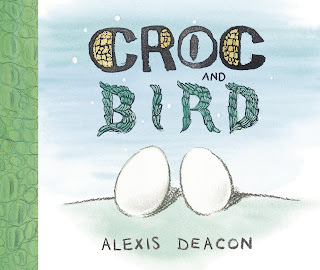 Disclosure: I received compensation for publishing this guest post. Right now I am prepping Lara for the arrival of baby and her new role as BIG SISTER and have been on the lookout for gifts which I can offer Lara at the same time that our house is filling full of baby products and gifts. This Tiny Tatty Teddy bedroom door plaque from www.bycarteblanche.com is the first little token that I hope will make Lara feel a bit more grown up and like she has some sort of authority in our household. The name plaque costs £4.99 and comes with some sheets of letter stickers so that you can add your child's name to it. I then gave Lara some more Tatty Teddy stickers so that she could decorate it in her own style before attaching it to her bedroom door. Now Lara knows that her room is all her own and that the nursery is baby's realm. I think it was a big hit! As you know, I'm someone who would always, always try the natural option in life first and see if it is effective. During my postnatal recovery after Lara was born, I tried arnica as a homeopathic remedy to speed up the healing process of my episiotomy - I was very impressed with the speed of healing (mind you, there were all sorts of other complications it couldn't help me with) and will definitely be using it again. What I hadn't considered was using arnica as an external use remedy for aches and pains or swelling so over the past week or two at these late stages of pregnancy I have tried out Atrogel Arnica Gel as a natural remedy for some common pregnancy complaints. Arnica gel is made from the flowers of the arnica plant - the gel has quite a nice 'gardeny' smell, nothing too medicinal, and it is non-greasy and very quick to absorb. I've used it for two different pregnancy complaints - swollen ankles and an achey back. Right now, my achey back isn't so much about the weight of baby on my softened muscles, but more about the pressure of baby on my lower back and pelvis so there isn't a lot that arnica can do for me but it is nice when Mr. B. massages it into the area around the top of the back of my pelvis which he can do upto 4 times a day. I don't feel any instant relief from the gel, more from the massage to be honest. I wonder, if I had used it during the earlier stages of pregnancy, when the backache genuinely was muscular, whether the arnica gel would have been more effective. I've had a lot more success with the arnica gel for relieving swelling. In the past 10 days or so, my ankles have begun to swell as fluid collects at the base of my legs - I have started to have to wear Mr. B's socks because mine are too tight around the ankles! When I get home from work, there is nothing better than taking off those socks and rubbing in some cooling Atrogel and within half an hour the swelling goes down and my feet and ankles feel right as rain. Arnica gel can be used to combat swelling after injury too. Atrogel might not have the same tingling effect as some of the minty foot gels (none come much more tingly than Mama Mio Lucky Legs) I've tried for exactly this problem in the past but it is as effective, if not more so. It also feels like better value for money than a cosmetic foot balm (Atrogel costs £6.35 for a 50ml tube) because, when my pregnancy is over and I no longer have feet the size of a yeti, there are lots of other uses I can put the Atrogel whereas a foot gel might spend the next few years unused in my cupboard. Behold, the only official photograph of me with a bump during this pregnancy (OK, the only one I'm brave enough to admit to). This photo was taken for Lexis Agency as part of the preparation for the new Sterimar Baby facebook page which officially launches next week (stay tuned to Mellow Mummy to find out how I'm getting involved). Obviously my bump is quite a bit bigger now; it was a couple of months ago when this was taken but it is a great picture never-the-less. In it, I'm sporting a gorgeous Vanessa Knox crossover maternity top that I won from A Mummy Too. So, what has been going on this week? On Monday morning I started getting strong Braxton-Hicks at work which lasted pretty much 24 hours. If it wasn't for the fact that there was no consistency in strength or frequency, I would have started to think that it was labour but something inside me just knew it wasn't. Despite this, I did make sure I had the phone number of the hospital at the ready and insisted that Mr. B. pack all of the bags into the back of the car. Ever since then, the movements of the baby have been very strong and distinctive; pretty uncomfortable at all times, especially when there is a fist being bashed repeatedly into my pelvis. I have pretty much wound up everything at work now so I am cruising for this final week. Phew. I have also come to an agreement with work over my childcare vouchers which I will, at one point blog about once I've clarified all of my legal facts. It has been a struggle and hasn't come to the conclusion I wanted but I have lots of lessons and info to share with other working second-time mums. In the meantime, if you want to ask me about childcare vouchers then drop me a mail (to the address on my contact page) - I've become somewhat of an expert on the financials of childcare vouchers and the detail of the employment law that governs them! So here it is. The big reveal! We are now all ready for baby's arrival and the nursery is fully kitted out. Most of the furniture in our nursery was second hand when we got it for Lara but with a bit of a scrub, the room has come up looking really nice. We did invest in a new chest of drawers to stay in keeping with the nursery, and a mobile for the crib. Actually, we plan for baby to sleep with us in our bedroom for some time but it is nice to have the room ready and available, perhaps for afternoon naps. I don't think baby Button is going to be short of company - currently the nursery is known as the 's-bear room' and is home to my collection and Lara's collection of teddy bears. Baby is already building up quite a collection too - I'm not sure there is going to be room for them in that crib! This recipe for a soft apple and cinnamon cake came from Dora's Little Cooks Collection. Lara is really enjoying her subscription to the magazine - I'm not sure what she enjoys more... the cooking, the stories about Dora, Boots and their friends, or the exciting Dora cooking accessories that come with each issue (subscribers get even more freebies!). Over Easter weekend, as a bit of a break from the chocolate eggs, Lara and I cooked a butterfly cake using the silicone cake mould that had come free with the latest copy of Dora's Little Cooks Collection and followed the main recipe in the magazine to make an apple cake using the mould. Lara very cautiously grated an apple (I'm not sure who was more scared about her finger tips, Lara or Mr. B). She stirred the apple into 150g of self-raising flour and 65g of soft brown sugar and a teaspoon of ground cinnamon with a great big grin as she followed the recipe. Then she added 65ml of milk, one egg and two tablespoons of vegetable oil. Several of the Dora recipes have used rapeseed oil as the main fat in a baking recipe which is something I had never come across before - the cake doesn't come out tasting as rich but I'll admit it has a brilliantly soft and bouncy texture. Lara and I scraped the mixture into the butterfly mould (this was a very messy experience!) and put it into a 170 degree fan oven for about 35 minutes. While it cooked, Lara coloured in some of the pictures of butterflies in her magazine and we learned a new spanish word - Mariposa (butterfly). Once the cake had cooked we cooled it on a rack and then I trimmed off the top of the cake to make a flat surface. Lara and Daddy chopped some fresh bananas and strawberries and then Lara had great fun decorating the top of the cake... and oh look, there's her posing face again! With easter out of the way, I've been trying to wean Lara back on to non-chocolate snacks which has resulted in lots of arguments. Lara likes to snack on cucumber, on fruit and on chocolate buttons (or anything else chocolate that is within sight) and she will often turn her nose up these days at anything else I might offer whether it be sweet or savoury. For that reason, I was quite surprised with the enthusiasm with which Lara took to the new spring range of toddler snacks from Ella's Kitchen. Thew new snack range from Ella's Kitchen includes three different flavours of Munchy Biccies and three of Nibbly Fingers, both of which are suitable from 12 months old. 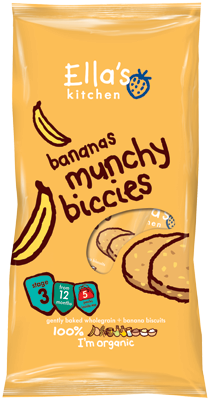 Lara tried out the banana flavour Munchy Biccies which come in a big bag containing 5 separate packs that you can stick in your changing bag or in a lunchbox. The biccies are small, about the size of a 2 pence piece, and made from a quite savoury biscuit mix. The fruit flavours are used to sweeten the biscuits - I tried a pack myself and absolutely loved them and could understand why Lara demolished them so quickly! The banana flavour was quite subtle and I'm looking forward to trying out the cheese and apple flavour (I'm not a big fan of cinnamon with orange but I think Lara would love them). All of the Ella's kitchen snacks are made from 100% organic ingredients and contain no refined sugars. Ella's Kitchen Munchy Biccies are available for £1.79 for a pack of 5 snack bags from Tesco and Asda. This week I have fought off a tummy bug that Mr. B. and Lara seemed to get a lot worse than I did. I think perhaps my body just kicked into protect me and my baby at this late stage. It was a wonderful excuse for a couple of days in bed too! I'm also beginning to dread childbirth. Not so much for the pain of birth itself but more because of the annoying after effects such as hemorrhoids and constipation which have already started bringing me discomfort even before childbirth this time. It is pretty miserable and I really hope I don't have another 4-7 months of this to look forward to. I had my 38 week check with the midwife. Everything was in order. Baby had unengaged itself but I don't think that's a problem. I've just got to sit back and wait now. The British Coffee Association settled my mind this week about having been drinking coffee during pregnancy. As you may know, just before I fell pregnant last summer I had started a Slimpod program which had the interesting side-effect of having reduced my caffeine intake. I have continued, at that reduced level of about 1 cup of coffee and 2 cans of Diet Coke throughout my pregnancy and this has got me some very strange looks from people - especially at work. If you‟re pregnant then it is recommended that you limit your intake of caffeine to no more than 200mg per day from all sources which includes tea, coffee, cola and chocolate – equating to 2-3 cups of coffee a day (see NHS Choices) but for some reason, every time I have mentioned to any of my colleagues about how wiggly this baby seems to be compared to Lara, they nod knowingly towards my coffee cup and tell me that it'll be the caffeine causing it. Ah well, I guess I will still be moderating my coffee intake a little once I am breastfeeding but hopefully I can look forward to some super-duper homemade Mr. B. stylee coffee once baby arrives to help me through some of those sleepless nights. Lara and I were sent some samples of the new range of Brioche products from Warburtons. We had a brioche roll picnic in the garden, a brioche swirl tea party and then one weekend we decided to make a quick but naughty afternoon snack by turning some slices of Warburton's new chocolate chip brioche loaf into a sweet eggy bread. Nom. Beat the eggs in a bowl that is big enough for you to get the whole slices of brioche into. There is no need to add any sugar because the brioche is quite sweet. You only need to add in a tiny bit of milk if the eggs are very thick. Heat the oil in a wide flat-bottomed frying pan on a medium to low flame. Dip each slice of brioche into the egg mixture until it is just coated. Don't leave it to soak too long or else it will take FOREVER for the egg to cook through. After dipping, place each slice directly into the frying pan. Cook the first side of the brioche for about 2-3 minutes, being careful not to let it burn. Flip the brioche and cook for a further 2-3 minutes on the other side before removing from the pan (check the first one to make sure it really is cooked all of the way through). Dust each slice of eggy bread with icing sugar to take the savoury edge off the egg. We enjoyed ours left-like but I was tempted to eat my chocolate chip brioche eggy bread with a spoonful of tart homemade plum jam. If you haven't yet heard about my epic road trip across Europe this summer, then where have you been? Plans are really getting underway for our #FamilyRoadTrip2012 and I have started booking hotels and ferries and whatnot (well, trying to anyway). The weird thing is that right up until Christmas, the mellow family had been planning a quiet and sedate UK holiday up in Scotland. Mr B. and I have been threatening to go to Scotland ever since we first started seeing each other and this year, with a new baby in the family, we thought that a main summer holiday in the UK rather than abroad would be the best way to go. So what stopped our search for cottages in scotland? What convinced us to trek 2000 miles across Europe in a car instead? Well... mainly family! Only a big family wedding in a fairytale castle in Poland could make us change our plans quite so dramatically. We considered quickly popping over to Poland by plan but the costs seemed prohibitive and fear was struck though us at the prospect of travelling on a low-cost airline in the middle of the night with a three year old and what will be a 3 month old by the time the journey comes round. So, now instead of browsing online for holiday cottages near Fort William, I'm spending every evening browsing for Gasthofs near Hannover and Hotels in The Netherlands! We have decided to make the journey to Walbryzch in Poland and back again over 10 days. Travelling through France, The Netherlands, Germany to Poland and then back again through Germany, Belgium and France. I will be blogging and tweeting the journey and sharing it on facebook with my followers AND while we travel, I will be raising awareness of the great, great work done by The Children's Trust – a charity for children with long term disabilities (I shall tell you more about their work at a later date but in the meantime, if you fancy donating to The Children's Trust, you can do so through the widget at the top of my sidebar). Wish us luck on our mammoth road trip and follow the plans and journey online at www.parentwheels.co.uk as we build up to the trip in July and on twitter using the hashtag #FamilyRoadTrip2012. This is a sponsored post but that doesn't stop it being fun to read. This recipe was inspired by one from Dora's Little Cooks Collection - the magazine featured a recipe for Stawberry Sundae and the magazine featured lots of fun games and stories all about strawberries and yoghurt. It came with a fab Dora mixing bowl and spoon. Mash the fruit and sugar to release the juices. You can use a fork or a potato masher! Put into a sundae glass that looks far better than Lara's beaker! Garnish with the remaining fresh blueberries and then enjoy! The Nourish skincare range is a range of natural cosmetics designed to gently target the signs of age using plant-based (and where appropriate, organic) ingredients. There are four key areas of products in the range to suit different skin types - Protect (for dry skin), Relax (for sensitive skin), Balance (for combination skin) and Radiance (for mature skin). I have been using some of the products from the Nourish Relax range over the past few weeks to see whether a natural moisturiser can be as effective at producing anti-ageing benefits as other products I have tried. 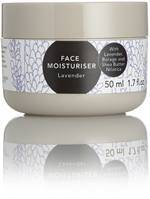 The Nourish Relax Face Moisturiser is an incredibly simple product. The cream is made from a sunflower seed and glycerin base which makes it a very thick cream and it reminds me of the simple base creams you can buy to mix your own at-home cosmetics. The active ingredients are lavender oil, borage oil and shea butter. The lavender oil definitely contributes to a feeling of relaxation when I use the moisturiser. When I was younger, I used to find the smell of pure lavender oil overwhelming but these days I appreciate it's ability to calm not just me, but my skin - it has natural anti-inflammatory qualities. The scent is balanced somewhat with some gentle citrussy notes from other organic essential oils. I enjoy using the Nourish Face Moisturiser for it's soothing and calming effect but I don't feel an immediate return on investment or a long-term benefit to my skin when I use it. The Nourish Relax Face Gel Serum has made my mornings that little bit more pleasurable! It is a very light facial serum that has a tingly, cooling feeling on the skin. As with the other products in the Relax range, the serum gel features Lavender as the primary active ingredient to help calm the skin and Aloe Vera to hydrate. It additionally features hyaluronic acid to help visibly smoothe the skin - I can't say I'm wholly comfortable with HA as a key ingredient as I know that it is frowned upon by some... but there is no denying that the effect of the serum on my skin each morning is definitely smoothing so I have mixed feelings about it. I think the Nourish Relax facial gel serum is the perfect way to start the day as it makes my skin feel refreshed and ready to take on the day as well as providing a smooth starting point for my face. One of the things I really like about the nourish brand is that the products look less serious than organic and natural cosmetics often do. The bright colours and bold graphics make the brand stand out - the products look fun and appealing. You can follow Nourish Skin on Twitter or Facebook. 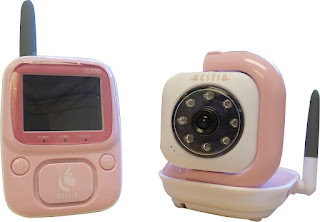 In the run up to the arrival of baby Button II we have been trying out the Hestia baby video monitor for my sister site, FamilyTech thanks to Comfy Babies, a brand new website for baby gifts. The Hestia wireless video baby monitor comes in blue or pink (choosing which one was a bit tricky given we don't yet know what flavour baby is). We plumped for pink given we already have a daughter and I was quite suprised at HOW pink it was!!! In fact, the product doesn't have a great quality feel to it at all - it looks a bit plasticy BUT don't let you put that off. At just £69.95 I think this is awesomely good value for money and I was really impressed by the functionality once I abandoned my judgemental first impressions. The Hestia H100 video monitor has two pieces. 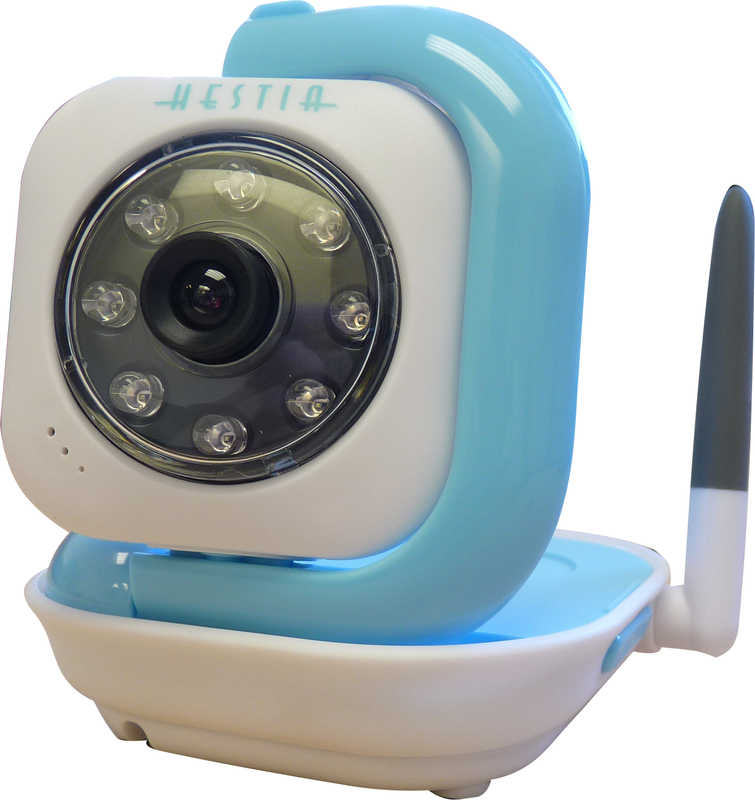 The camera unit which sits in your baby's nursery and transmits a very crisp quality image and the wireless parent unit that receives the image. You can sync upto 4 cameras with a single parent unit and then switch between camera views with a single button press. The camera unit has a limited range of movement but the adjustment is simple and easy to do so you will probably never have a problem positioning the camera where it can get a good view of your baby. You can also choose to mount it on the wall if you want to. The colour quality on the parent unit is a little washed out (grey and milky and not awfully representative of the real-life colours) but the image clarity makes up for this. It compares VERY favourably with other video baby monitors I've tried in the past in terms of the clarity of image and sound. The parent unit when used in VOX mode, is capable of switching itself off after a period of inactivity in order to save energy; with many other brands of baby monitor (video or otherwise) I have found the point at which the parent unit is triggered to come back on again a bit too late but the Hestia baby monitor responded promptly to sound in my daughter's nursery. At night, or in low lights, the camera automatically uses infra-red technology so that you can continue monitoring your baby. The Hestia H100 wireless baby video monitor doesn't play music or provide talkback - it just provides a simple yet secure monitoring device and it seems to do that well. 37 weeks is officially term and baby, should it arrive now, would no longer be considered premature. It feels like an important milestone and perhaps now I should be rooting out things like Raspberry leaf, pineapple and hot hot curries (not that any curry I make isn't mind-blowingly hot on the normal scale of things). Baby has slowed down a lot. I think it has more or less run out of room so any wiggling I do feel is really pronounced and can usually be seen by everyone in the room! This weekend we are really concentrating on spending quality, fun, family time with Lara. I've taken a REALLY long weekend off work and we have already done crafting and gardening together and over the weekend we have plans for an easter egg hunt and lots of cooking together. We haven't bought Lara an easter egg this year due to the phenomenal amounts of chocolate she has already consumed over the past week or so at nursery and as gifts. Instead, we went on the lookout for non-chocolate options. Our easter-egg hunt is going to be blueberry, raspberry and strawberry based and Lara's main pressie came from ASDA - it is a great big bag of brightly coloured ball-pool balls to turn her paddling pool into a ball pool. They are just one of the toys, homeware and DIY goodies that is on sale for less than £5 at ASDA this easter and given that I would have spent about a fiver on a nice chocolate egg for Lara, it seemed like an appropriate alternative gift. Until a few years ago (before Lara came along), I never used to suffer from hayfever. I was diagnosed with allergic rhinitis, probably caused by tree pollen and after a bit of experimenting, I found that loratadine tablets (a non-drowsy antihistamine) seemed to clear the problem up most of the time. Now, the problem with loratadine is that my G.P. asked me to discontinue using it during pregnancy, but particularly when breastfeeding. This leaves me once again looking for a more natural solution to my niggly hayfever problems. At this time of year, pollen levels are just beginning to rise (I can tell this by the gungey yellow colour of our ordinarily-black car) and for many it is the start of a summer of hayfever. Thankfully for me, hayfever has never been something that has an enormous impact on my life but it is phenomenally annoying to have a runny nose and an irritating cough caused by the gunk that collects in my throat. It also frustrates Mr. B. because the coughing stops me from sleeping and the gunk means I snore. 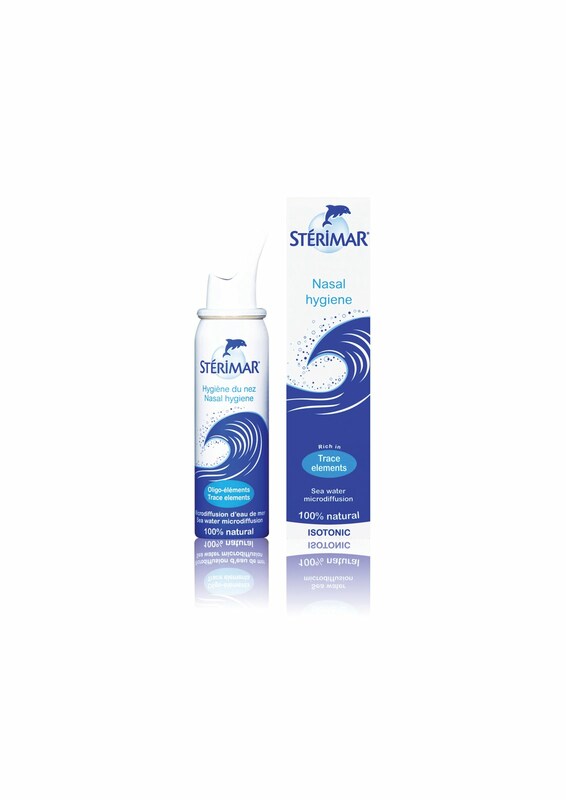 As a Sterimar ambassador, I wasn't suprised when they recommended Sterimar Isotonic Nasal Hygeine as a long-term solution to the problem - I just hadn't considered it before because I knew I had a solution of my own. But, seeing as I now can't use my normal tablets I'm going to give the Sterimar a go this spring and summer, having used Sterimar Congestion Relief successfully over winter to combat the equally-annoying post-nasal drip that I experience after a cold. Because Sterimar is made from 100% natural sea water, it is safe for me to use both now at the end of pregnancy and after the birth when I'm breastfeeding. I've only been using it for about 10 days and I'll admit that it is a hard habit to get into and I've forgotten a couple of times so at present there is little sign of an improvement. Mind you, I did spend A LOT of time outside in the garden of the weekend so my runny nose is likely to be at its worst right now anyway. 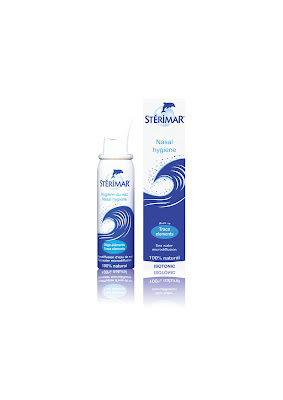 Theoretically, regular use of the Sterimar salt water spray should help clean my nose and help my own body to do what it is supposed to do naturally - filter out air-borne allergens. So, I'll keep on using the Sterimar Isotonic and keep you updated on whether I think it is effective as a natural solution to the allergic rhinitis. Disclosure: I am a Sterimar ambassador. I receive a financial contribution for my ambassador activities (which include more than just blogging). I personally use Sterimar (mainly because it is easier than performing a home-made nasal douche), I recommend it and wholeheartedly believe in all of the comments I make about it - whether they are positive or negative comments. Lara and I quite often cook curry together, either on the hob or in the slow cooker. Lara has developed a taste for curry of different types - much like her mum and dad (and grandma and grandpa). Recently we were asked whether we would like to write a post about Quorn - a meat substitute and I thought that one of our traditional family curry recipes would be a perfect test to put Quorn to - could it be healthier, but just as tasty as our normal family fayre? And so, Lara helped me to make (and eat) a very simple Quorn Dansak, something I normally make with chicken breast or chunks of lamb. Heat the oil and gently fry the onion until soft. Then add the ginger and garlic for a minute before popping in the turmeric, curry powder and chilli powder. Fry for 1 minute. Add the Quorn pieces and fry for a further minute, being careful not to let the spices catch. Add in the lentils and then the stock liquid; stir well and bring to the boil. Reduce to a simmer and cover. Cook for about 20-30 minutes until the lentils are soft and beginning to disintegrate. Be careful towards the end of cooking because the lentils WILL stick. Make sure you top up with plenty of hot water should you need it. About 5 minutes before serving, stir in the Garam Masala and also any salt and pepper that you fancy. Mr B., Lara and I were all really impressed with how the Quorn stood up to our family curry test. You could definitely tell there was something different about it but it was incredibly close to the chicken version I normally cook... mainly because the only difference in the entire dish was the Quorn instead of the chicken - everything else remained exactly the same. We served our Quorn dansak with steamed rice, mango chutney and mini naan bread. I think the Quorn needed the strong flavours of the curry to support it and probably would have found it too lacking in flavour on a milder dish. The good news is, I'm willing to try Quorn in some other dishes now. It is much lower in fat than some red meats and compares really favourably in price. If I were to make this dish using free range chicken breasts from my normal supermarket, the meat content would have cost me about £8 but this packet of Quorn cost just £3. If I could replace just one meat dish per week with Quorn I could reduce my fat intake, grocery costs and, potentially, my impact on the environment (although I admit I haven't researched the last of those yet). There are loads of everyday recipes on the Quorn website that feature Quorn instead of their traditional meat content. You can also find more recipes from REAL people like me (well, I'm real aren't I?) on their facebook page where I intend to share my Quorn Dansak recipe too. This is a sponsored post but that doesn't stop it being a fascinating read - does it?